Swarms of gold bugs from around the United States are abuzz with anticipation since ITM Trading announced today the launch of its upgraded website. our goal was to create an online experience that puts the customer first. Swarms of gold bugs from around the United States are abuzz with anticipation since ITM Trading announced today the launch of its upgraded website, offering hundreds of new gold products from mints around the world, as well as a variety of rare U.S. gold coins, monthly educational webinars, and free shipping on all orders. The website provides simple navigation for visitors to buy gold and silver coins and bars, learn about the precious metals industry, and interact with the ITM Trading precious metals experts and support team. 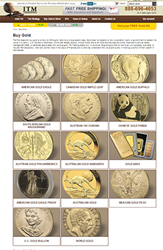 The hundreds of gold and silver products offered online through ITM Trading range from silver bullion coins under $10 to rare pre-1933 U.S. gold coins and large gold bars worth tens of thousands of dollars. The experience caters to both collectors and investors; ITM Trading’s online inventory includes gold and silver products from all over the world, including industry renowned mints and producers. All orders placed online include free shipping. ITM Trading’s free monthly webinars allow consumers to learn more about the perils facing the economy as well as strategies to protect their wealth. The webinars also provide a platform for consumers to interact with ITM Trading and discuss the economy and precious metals with the company’s Chief Market Analyst, Lynette Zang. Much of this content is available to read or watch online at any time via http://www.ITMTrading.com. ITM Trading has an A+ rating from the BBB and a 100% delivery rate on gold and silver orders placed through the company’s website. ITM Trading, Inc. is the physical precious metals market leader. Founded in 1995, ITM Trading has established an unsurpassed track record of successfully delivering products to its customers. The company handles most forms of gold and silver, as well as rare coins, and provides a two-way buy-sell market for collectors, investors, and dealers. ITM Trading enjoys preferential access to the highest quality rare coins at the most competitive prices. In-house professional numismatists constantly scan the market and examine market conditions to help its clients to obtain the right products. All of the U.S. rare coins that ITM Trading sells have been certified and graded by either PCGS (Professional Coin Grading Service) or NGC (Numismatic Guaranty Corporation), the two foremost coin grading firms. ITM Trading also carefully examines each product prior to selling to its customers. Integrity, reputation, and superior customer service are the foundations for the company’s longevity and success. For more information about buying gold and silver online, visit http://www.ITMTrading.com or call 1-888-696-4653.